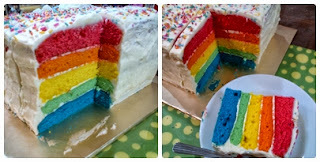 Since I am making a rainbow cake, I doubled the measurements and I got quite a large batter. I then divided the batter into five because I have five food colourings i.e. red, orange, yellow, green and blue. I didn't have purple and I totally forgot that red+blue=purple. 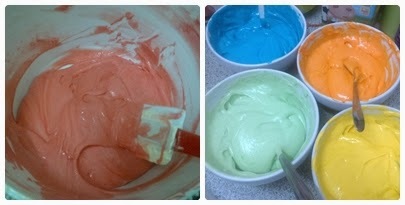 Baking each colour takes about 15-18mins because the layer is thin. However since I don't have two baking tins of the exact same size, it takes quite a while because once one layer is done, I have to transfer it on a cooling rack, replace the baking sheet, pour the next batter and bake again. My oven isn't big enough to hold two tins at a time anyway. The baking part was really long. 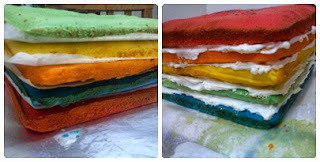 I let the cakes to cool down overnight and I put the baking sheet in between the layers so they don't stick. I then covered with a cling wrap. The next day, I asked hubby to buy butter to make the buttercream frosting. Frosting the cake is quite a challenge for me. One, my icing is a bit too sweet. Two, the texture and consistency of my icing isn't smooth so I ended up with sort of a 'rustic' look on my cake, or so I would like to believe. While I was frosting my cake, hubby took Babycakes to swim in the pool so I get to work in peace because the previous night Babycakes keep peeping at my cake and said 'Nak! Nak!' and I know she was just too intrigued by the colours of the cake. I'll have to wait for her to be slightly bigger before I can get her involved in my baking projects or I'll end up with a very messy kitchen and toddler. 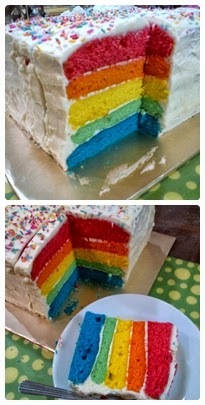 I sprinkled the top of the cake with colourful strands to give a hint that it's a rainbow cake. I brought it over to my aunt's house and I was just in awe when I cut the cake. Just look at how vibrant the colours turn out. I am amazed at myself! 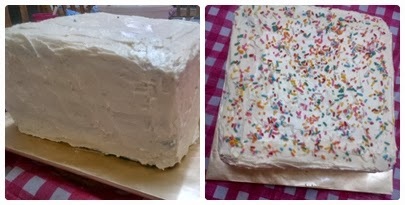 :) You can clearly see that the sizes of the layers are uneven and the frosting too is uneven but heck, it was my first time and I couldn't be more happier for myself. I need to learn how to make a nice frosting which is less sweet and easy to spread. Next time I must remember to make the colour purple. All The Best, Baby Turtle! Do Not Order From apampolkadot.com. Cinnamon Twists for tea, anyone?